This one turned out so cute and can be done in as little as fifteen minutes. My kind of project! I was recently at Jo-Ann Fabrics and saw some pre-shirred cotton for $0.25 per inch. 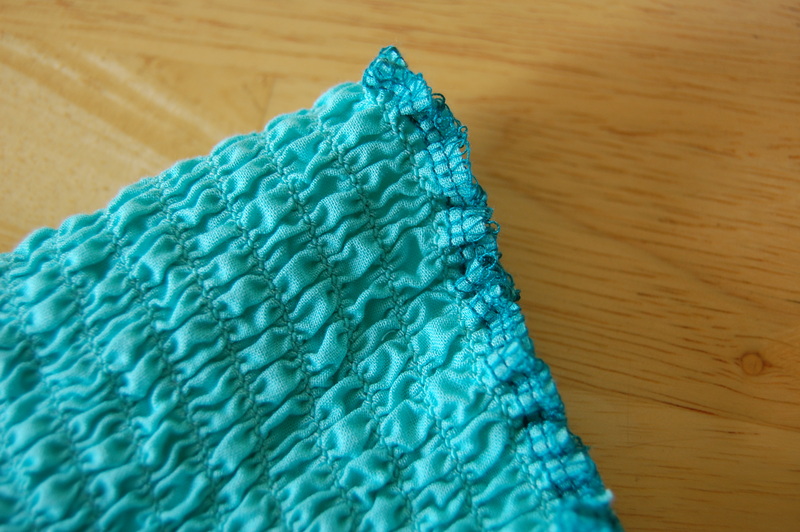 It looked like something I could easily sew a bottom onto and turn into a dress for Calista, so I picked up some of it in turquoise. It’s pretty wide and looked like I could cut it in half length-ways to make two dresses from it, so I picked out two cotton prints to match. I am very much a pattern sewer and anything done without a pattern (or at least a tutorial) is way out of my comfort zone, but I’ve been trying to be more adventurous, so I headed home to try my luck. I bought 27 inches of the pre-shirred cotton as I wasn’t entirely sure of Calista’s measurements (note to self: measure children and keep in purse for this reason), which was just about right. 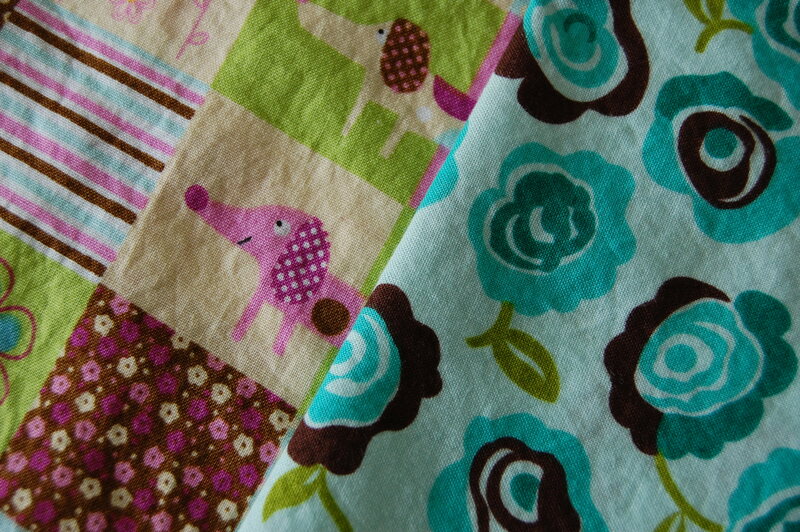 I bought 1.5 yards of each of the cotton prints, which proved to be way too much. I could have easily used just under a yard, if that. 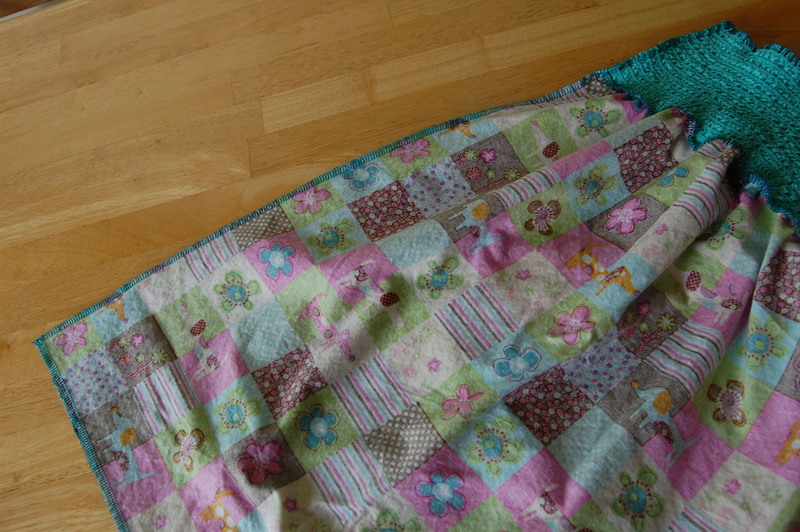 I cut the pre-shirred cotton in half lengthwise between two rows of the elastic stitching. This left me with two pieces with one finished edge and one unfinished edge. 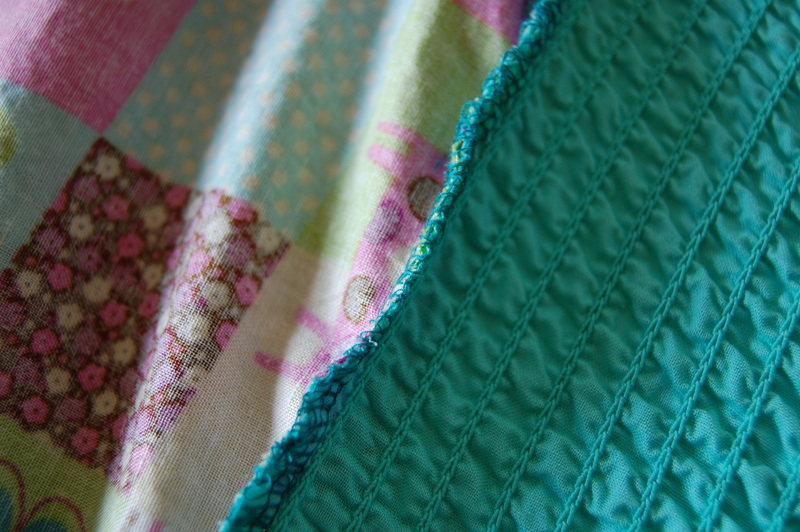 However, one of the finished edges has about a 1″ hem on it, where the other is hemmed close. For the one with the extra hem, I cut the extra fabric and then needed to somehow finish the edge. I had messed around with bias tape (didn’t work well) and had briefly considered turning and hemming the edge (too lazy). Finally, I just serged along the edge to trim it and give it a simple finished edge. After that, I sewed the pre-shirred cotton top to the cotton print skirt by putting them right sides together and stretching the pre-shirred cotton as I sewed. The top ended up exactly fitting the 45″ length of the cotton print, so I didn’t even have to do any trimming or pieces together for the skirt. I’m stretching the shirred top in the picture below to show how I sewed it together. Next, I folded the dress in half with the right sides together and sewed up the long raw edge for the side seam. I chose to “hem” the dress by serging, but next time, I might put a cute ruffle on the bottom. I’d have done it this time, by my shirring foot was being stupid and not gathering properly. Last up was some sort of straps to hold it up. Again, in the spirit of complete laziness, I went with the easiest thing I could think of, and that was a long tie made from a 2″ strip of the cotton print I had leftover after hemming the dress. 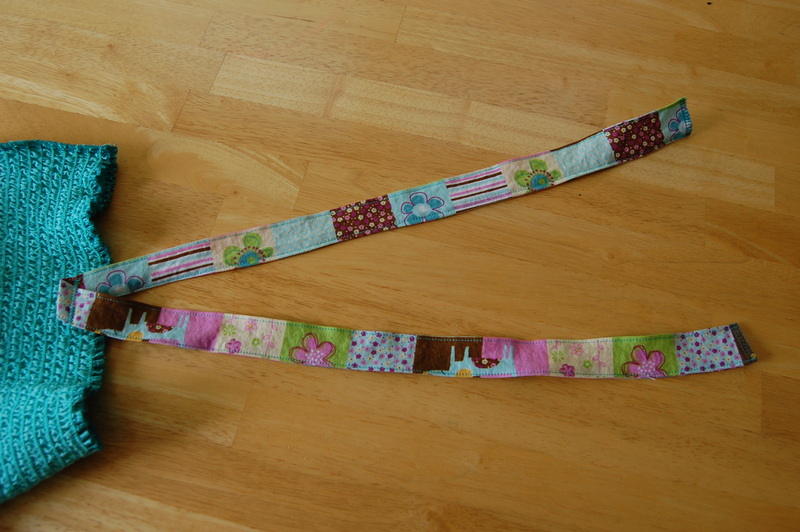 With the right sides together, I sewed along the long end making a tube. I turned the tube right-side out and then did a straight stitch along each long edge to keep it flat. I serged the edges closed and folded it in half in a “V” shape and used a zigzag stitch to sew it to the center of the inside of the top of the dress. Turn it right-side out et voila! 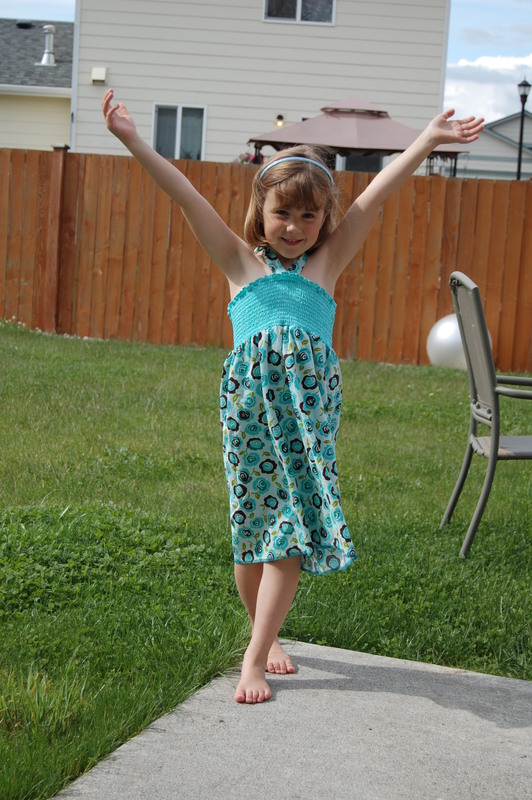 A Super Simple Summer Dress, ready to wear. To make both dresses, it cost me less than $17. I used a 40% off coupon for one of the fabrics and already had the thread. Love this dress! I love the patterns you picked to compliment each other. I might just give this a whirl. Thanks!